There are plenty of JUnit tutorials available online. They are often written by testers with a reasonable amount of unit checking experience. The problem is that experts and beginners see things differently. I began noticing that beginners often read these JUnit tutorials written by experts and come away feeling like there is a unsurmountable mountain of knowledge they need to learn before applying the concepts. So we decided to try something different – writing tutorials for beginners by beginners. 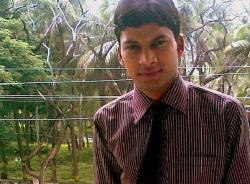 Rupesh Mishra, a Qxf2 Services employee, volunteered to write this post. 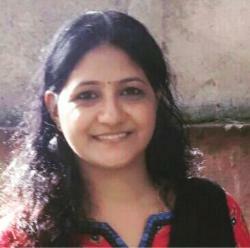 The rest of the post is written by Rupesh. To write your first Java program using Eclipse your system should have an updated version of Eclipse. You can download and install Eclipse from here. 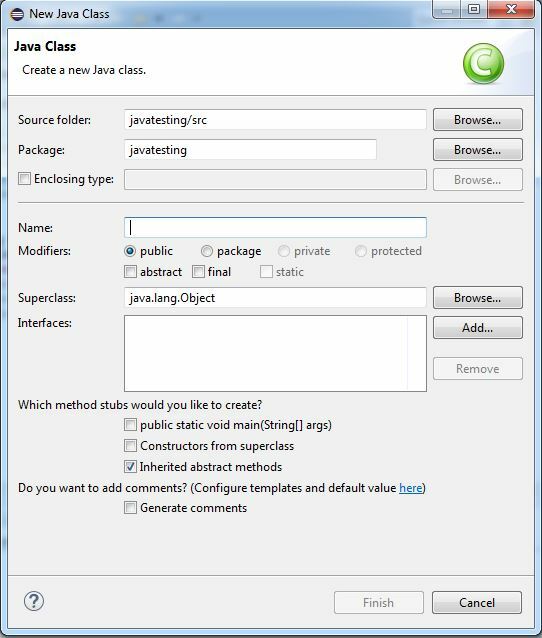 Now in Eclipse IDE, to create your first Java project click on File -> New -> Java Project. 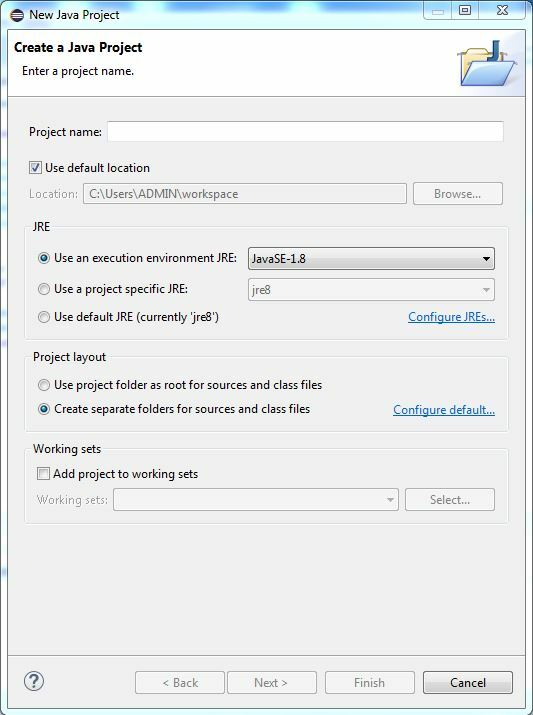 Now I got New Java Project window to create a project. Tick mark the check-box for “Use default location”. Under JRE section select radio button for “Use an execution environment JRE”. 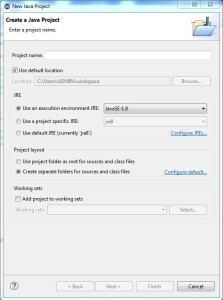 Under Project layout section select radio button for “Create separate folders for sources and class files”. Keep remaining as it is. Click Finish. 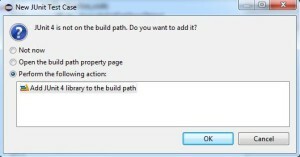 To create a new Class right click the Project. For me project name is javatesting. Source folder should be “Project name / src” like-javatesting/src. Normally package name will be same as project name. 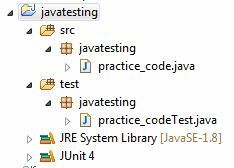 Here I created a very simple Java program in practice_code.java under project name javatesting to test with JUnit. In this program I am truncating character ‘A’ if it comes to the first two places of the string. 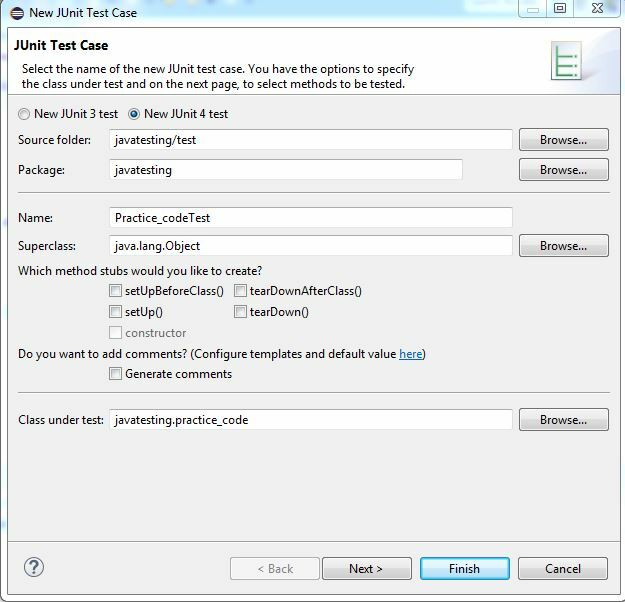 In order to test this method using JUnit, I must add JUnit to the path, create a test class and implement a test. Eclipse has JUnit support and we can use it. But before creating a test class its good practice to create a new source folder dedicated just to test. 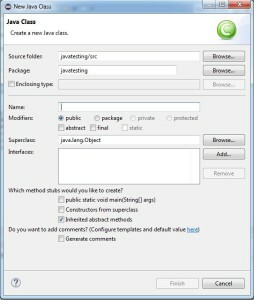 Right click to project name javatesting, choose New->source folder, name it test and click to finish. Name of the this test class will automatically be your Java class name + Test. 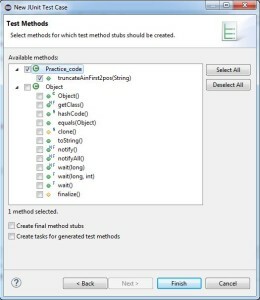 You can change it if you have to create multiple test classes for the same Java class. Keep remaining options as it is and click Next. Now you can select methods for which you want to create your tests. I am selecting my only method “truncateAinFirst2pos(String )” under class Practice_code. Click to finish. 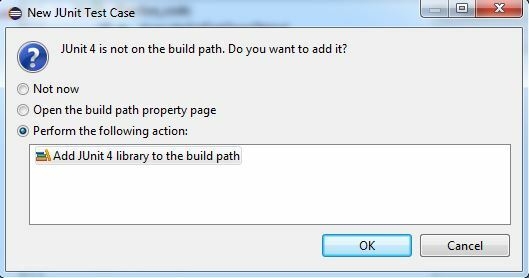 If this is the first time you are doing this operation, Eclipse will ask you to add JUnit library to your class path. Click OK.
Now I got my test class file Practice_codeTest.java into the test folder. 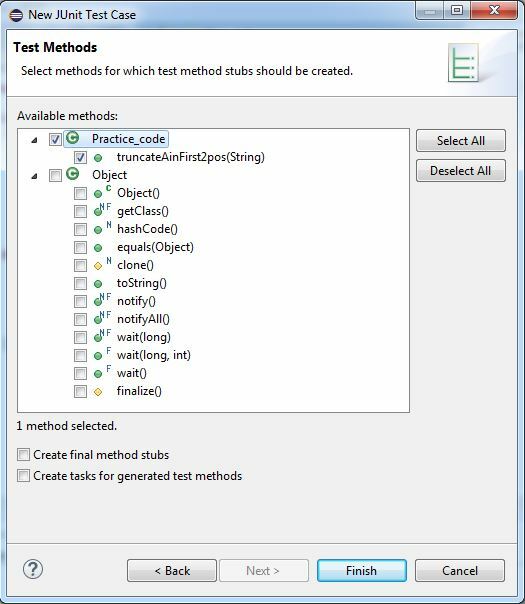 Eclipse already created a class named Practice_codeTest with method testTruncateAinFirst2pos() in our test file Practice_codeTest.java. 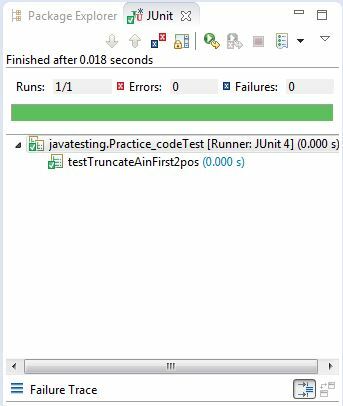 Here Eclipse has already imported ‘junit.Test’ to test the method and ‘junit.Assert’ to compare the test output with expected result. Lets put some condition in our method to test our class. Create a instance ‘InputString’ for the class Practice_code. Now I am going to use one of the JUnit methods named assertEquals which allows me to compare expected output with actual output. 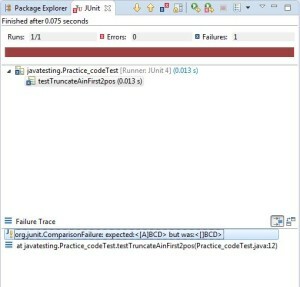 Here is my complete Practice_codeTest.java file to test the method truncateAinFirst2pos() in Practice_code.java file. My project files structure is looking like this. 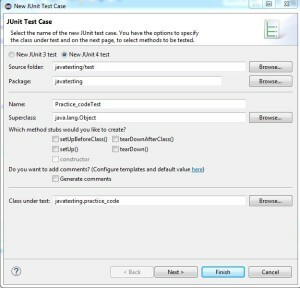 For execution right click on your JUnit class file, in my case Practice_codeTest.java and choose Run As->JUnit Test. 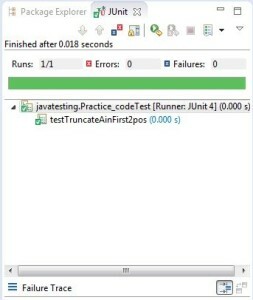 Here is Junit runner window, which shows Errors 0 and Failures 0 that means all pass. To show failure condition I am making some changes in my expected output. 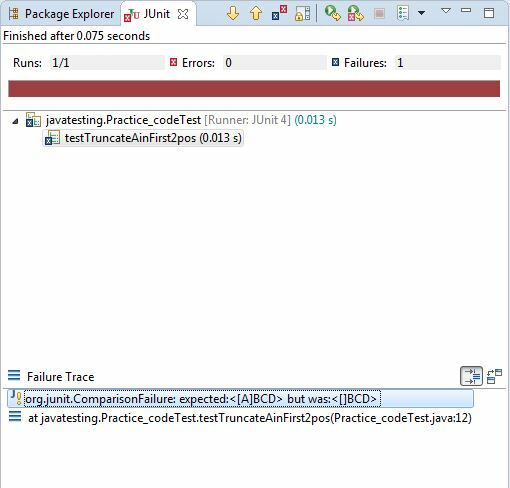 Now, as expected, in JUnit runner window I got Failures 1.JUnit clearly points out whats wrong in your code under Failure Trace as its showing here “expected:<[A]BCD> but was:<BCD>”. If I double click the Failure Trace line it will show the Result Comparison window. And that brings us to the end of the tutorial. Let us know if it helped having a beginner write for beginners. Stay tuned for an upcoming post on Junit asserts and matchers. Next Post Have you signed the petition to stop ISO 29119? Did u assume that the user has coding language experience ?? Sai, the post assumes that you already have some coding knowledge.